Richard Sandbrook's Place is for sharing experiences, stories and strategies for re-imagining and achieving sustainable development - a place where people can learn from the past, reflect on the present and work out how to transform the future. It's run by the Richard Sandbrook Trust. Share what you find, post your opinions, or get in touch about contributing to the site. 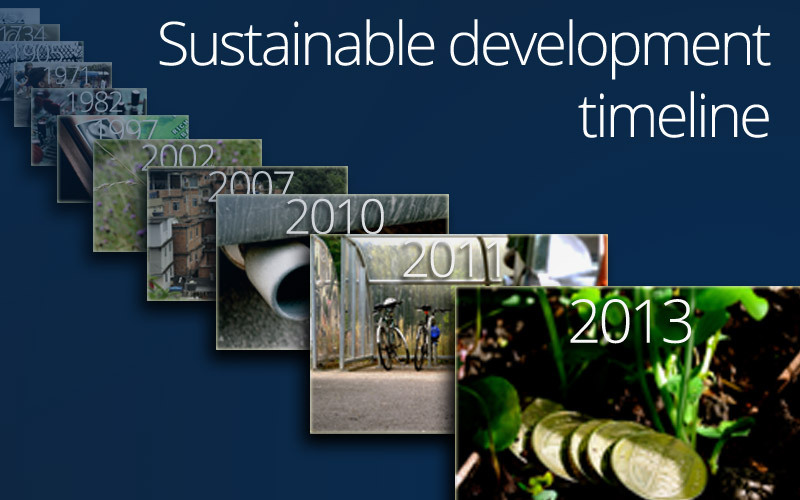 Explore over 800 seminal events in the sustainable development timeline. Energy, politics, disasters, movements, oceans, corporate responsibility - a movement that has developed in some places over thousands of years. Bill Adams looks at development in the field of biodiversity conservation, an area where success stories are often rivalled with news of extinctions, but also an area where tackling isolated issues of protection has moved to an understanding of biodiversity's integral importance to sustainable development. Green parties have been gathering political power since their early days in the 1970s. They're now becoming a coordinated diaspora, as Sara Parkin describes. In 1961, the year in which WWF was established, the world was a very different place. Then, around a billion people lived in the world, fewer than half the number now alive, global average life expectancy was around 30 per cent lower than today, and air travel was a luxury for the few while mobile phones and the internet were part of science fiction. Mark Halle takes a look at the development the World Trade Centre, and the role that the environment has played within it. Dr. R.K. Pachauri has been the Chief Executive of TERI since 1981, designated initially as Director and since April 2001 as Director-General. Crispin Tickell surveys the rampant rise of human population - from being a species to a geological period - and wonders if our size will eventually be our ultimate undoing. Sir Crispin Tickell has long been a pioneer in linking environmental and in particular climate change to the worlds of politics and business. Understanding about the harm caused by motor vehicles is widespread, but moving away from cars seems just too difficult. Stephen Joseph looks at some of the whys and the hows of alternatives for travel and transport. Starting with a motley group of businessmen, academics and scientists meeting in Rome in the 1960s, Ian Johnson looks at how the Club of Rome has influenced global thinking about sustainable development. Looking across perspectives, timelines and discussions, we've pulled out some answers to key questions in working towards sustainable development. Speed of change: how can we move fast enough? The modern-day sustainable development movement has developed principally over the past 50 years. But forecasts today suggest we don't have that long again to overcome perhaps much bigger challenges. So how can we move fast enough? How do we handle the scale of the challenge? The challenges of sustainable development are often huge, inter-connected, comprehensive and fundamental. Some practical steps from authors’ perspectives on getting over the sense of futility and making effective change. One of the characteristics that almost all sustainable development work has in common is working with a variety of different stakeholders. But multi-stakeholder working is complex and hard work: competing agendas, different ideas, managing egos, maintaining relationships... Why not just do it alone? Empowering marginalised communities: why and how? Being able to see beyond the here and now to a bigger, better picture of the future. Having the confidence, skill and understanding to communicate effectively and persuasively. Being hard-working, devoted and determined with energy and bloodymindedness. Having passion and harnessing it, having compassion and acting on it, and having a belief in the potential of the underdog, which often lies latent beneath the surface, but which, time after time, is shown to be worth believing in. Being able to stand back and see the wood for the trees, being able to think laterally and creatively about challenges, hurdles, solutions and opportunities that are sometimes not the obvious ones. Being provocative and not afraid to ask difficult questions, including about things that others are reluctant or afraid of probing into. Being a 'tempered radical' - seeking to change people, policies and practices not so much by fighting against them but working with them. Bringing people together in combinations, collaborations and partnerships that perhaps they, or other people, wouldn't have thought productive, so as to achieve particular results. Working with people and with experience, by taking the time to understand people and their experiences, and by establishing knowledge and understanding yourself. Paying attention to processes and practices, and also to people's learning: looking to effect sustainable change by changing hearts and minds. Read more about Richard Sandbrook.